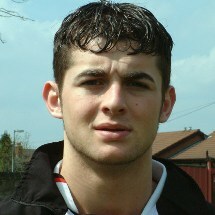 Striker signed from Woodley Sports in February 2004. Scored his 50th goal for the club as part of a hat-trick against Moor Green. Joined Droylsden on loan for the latter part of the 07/08 season before leaving the club and joining Altrincham having played 196 times for Hyde. After being released by the Robins in September 2010 he rejoined The Tigers under former strike partner Neil Tolson's leadership.